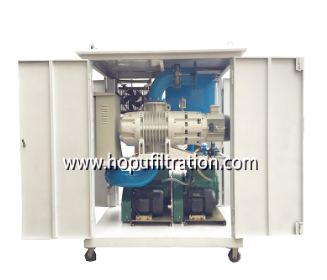 Vacuum Oil Purifier is a kind of equipment that is very effective in dealing with oil dehydration, degassing and exhausting. It plays a very important role in many oil fields. It not only deals with electrical oil, but also the effect of vacuum oil filter on insulating oil. Very good, because the gas content of the insulating oil has special requirements, it also indirectly requires the oil filter to have certain performance and device requirements. When selecting a vacuum Oil Filter to measure the gas content, these basic requirements should be met: all gas can be completely removed from the oil, generally requiring a degassing rate of 97% -99%; the degassing device should be airtight. , has a higher degree of vacuum. Generally, the residual pressure of the vacuum system is not higher than 0.3mmHg; when degassing, the volume of the degassed test oil and the volume of the gas to be extracted should be accurately measured. It is required that the physical measurement should be accurate to two effective figures; After the medium is removed, the gas should be prevented from being dissolved back to the oil; after degassing, the residual oil and residual gas can be completely drained. If you have demand about Oil Purification, welcome to leave a message or send email to us. We will reply you soon.